Chuck Dent "1998 Local Hero & 2011 Honor Roll"
Self-described "Angry young man of surfing"
PHOTO: When the daily 11am summer surfing curfew warning blasts out from lifeguard station zero on the pier, three young surfers demonstrated...L to R Johnny "Frog" Van Oeffelen, Johnny "Hot Dog" Boozer and Chuck "Profile" Dent. Archive photo, HB News Photo. Chuck Dent knew how to attract attention. 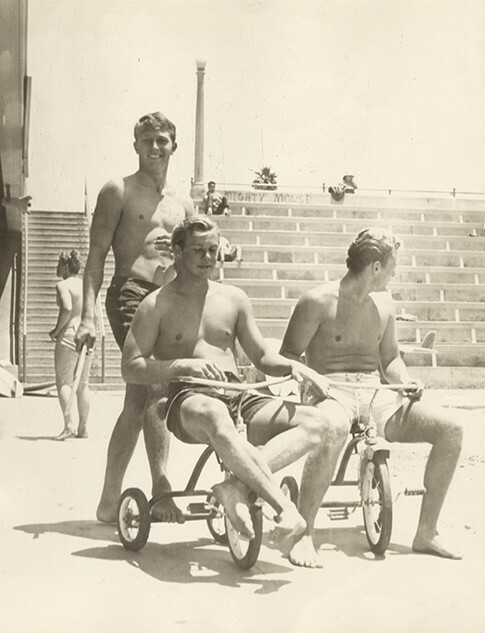 The man who once described himself as "the original angry young man of surfing" had a knack for salesmanship. Even though he wasn't the best surfer in town, his ability to cultivate an image as a great surfer compensated for athletic shortcomings. 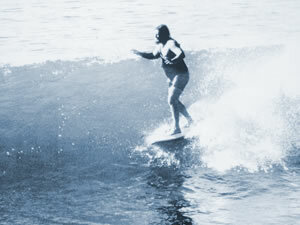 Before Dent died of a heart attack in 1980, at the age of 35, he had managed to create a cult following in the local Huntington Beach surf community. He was larger than life, always in character, whether he was cruising around downtown in his chocolate brown Cadillac, in his surf shop telling stories to the neighborhood groms, or in the middle of a party. Dent commanded a crowd, liked being the center of attention, and wouldn't have had it any other way. It was Dent who modernized the surf industry. He took the original idea of a surf shop - where the only merchandise available were surfboards, wetsuits, leashes, and wax and turned them into the full-service surf retailers they have all become today. Dent stopped surfing on a regular basis the last few years of his life. But once a year he would walk down Main Street with his board, and all the locals would shuffle out from wherever they were hiding, knowing that it was time for another of Chuck's annual rides. As a crowd they gathered to watch the one-man parade, Dent would paddle out, take one ride and come in satisfied enough to continue calling himself surfer. Even though he's gone, Chuck Dent's legend continues to live on. 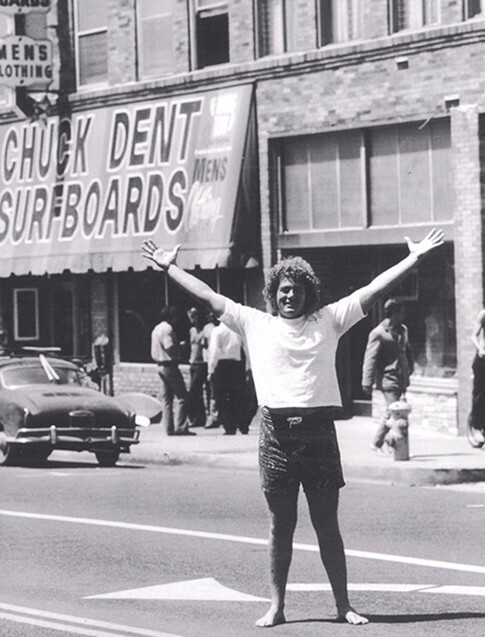 Besides the two surf shops in Huntington Beach that bear his name, people around Huntington Beach still bring up stories about Dent, recalling his wild antics, unique flair for business, and how above all, he stood for fun and individualism at any cost.